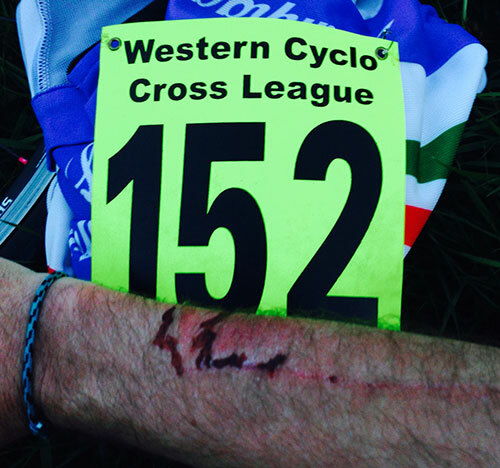 I’m officially bloodied in the world of cyclocross now – halfway through the race, with my head-down on the back straight trying to catch my breath, I bounced off of a tree … and I caught my other arm on an overhanging bramble… so I now have the scars & bruises to show for my first race. To be fair I didn’t see anyone else bleeding at the end of the race, but I do make a habit of drawing blood on my bikes rides, and I really enjoyed this first race and I’ll be back next week for more. Pulling up at the race an hour ahead of the ‘off’ I found myself at an area of green space between Cheltenham’s leisure centre and a housing estate, and it struck me that cyclocross races can run anywhere. Already there were people milling around, so I got myself registered (£15 for the race) and picked up my timing chip (these must make race management so much easier than trying to monitor the riders on paper). I had time to get a couple of laps in ahead of the 19.30 start and I recommend that anyone considering a cyclocross race for the first time makes time to ride the course ahead before the race. Whilst the course was fairly flat, it did slope and knowing that helped me to better gauge how to ride the course – and pre-riding the course meant that I could take a considered view of the circuit, rather than trying to fathom the literal ups and downs during the heat of a race. Also, whilst the course was far from technically challenging, there were a few large tree roots, several off-camber sections and a short piece of single track that it was good to see ahead of the race. The bike – my bike was loaded into the car ready to ride, complete with toolroll, the night before. So all I had to do at the race was unload and get on – no faffing with set-up, although I did borrow a multitool five minutes before the race started to lift the saddle a smidge, as the course was flatter than expected, so I could afford the increased leg stretch. 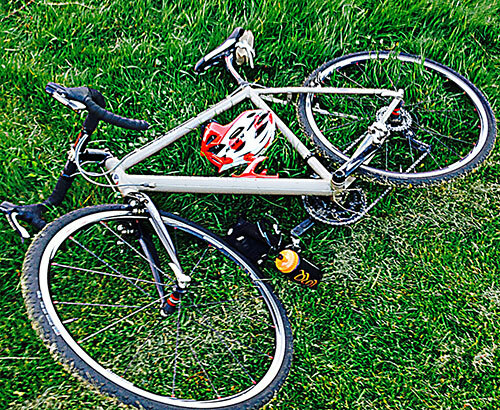 Clothes – This was my biggest concern, so I loaded a stack of different layers into the car, but on a sunny May evening I ended up in normal bib shorts and a short sleeve jersey. I was plenty warm enough during the race, although I recognize that on a grey day with some light rain that could be completely different. Pre-race fuel – I had to work on-site yesterday, so I kept it healthy albeit with more carbs than I would normally have during the day… bagel and eggs, baked potato and cheese, yoghurt and flapjack. I think that worked well. Race fuel – I carried a small bottle of water and luckily threw a handful of jelly babies in a rear pocket, and boy was I glad I did, as those little sugar hits each lap during the second half of the race kept me going. The race start was a little odd, I was expecting the race whippets to head off at 19.30 on the dot and some of the other categories (including my V50 – that’s Veteran for people of 50+) to start two minutes later – as it was the whistle went and everyone piled off together, leaving me right at the back of the pack. I think that worked to my advantage, as cyclocross is a personal race, not one-on-one in a pack, so I was able to use those in front me as pacers and pick off a few during the event. I say ‘a few’, but at the end I was 53rd out of 70. As I say, cyclocross is a personal race and I spent much of the race on my own, which on a short course was suprising. I would like to thank the faster riders for their consideration of those slower riders, like me, who they had to pass. I’ve ridden a mountain bike XC enduro (4 hours) before and that was pretty unpleasant on some of the tighter stretches, where it became a bit of a free-for-all – yesterday though, there was plenty of notice from faster riders about their intentions and no overtaking that put the less-experienced entrants at risk… bravo to the cyclocross community for that. 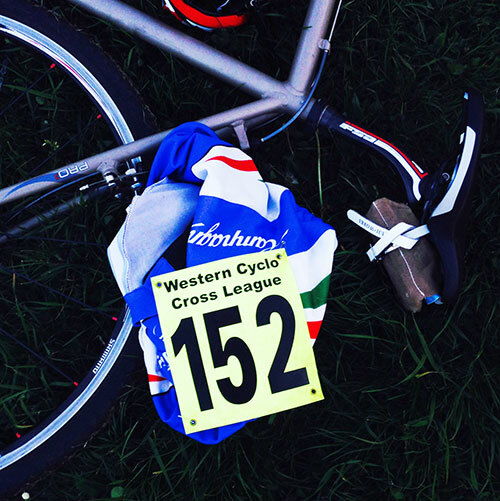 I knew that a cyclocross race was going to be 40 minutes of pushing as hard as possible and it proved to be a brilliant challenge of self-pacing. Around a third of the way in I knew that my energy reserves were flagging, but it only took a slight laying off of the pace to bring myself back on track… I then rode slower but more consistent laps and made it through to the end. I had a bit of cramp set in at about the two thirds point, but rode through that and managed a huge sprint to the line on my final lap. With hindsight I reckon that I could have ridden a faster pace towards the end, and should have taken advantage of the ‘ups’ to push harder and gain some time on other riders. 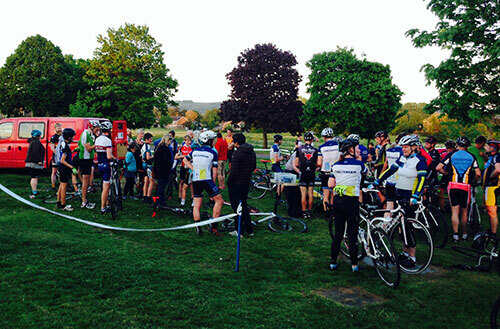 o – I was 53rd out of 70, which included the U14 and U16 riders. o – I was 11th out of 12 in my V50 category. o – I rode 9 laps in 56.43 mins – the fastest ‘9 lap’ rider in my category rode it in 50.43, so I have a target. o – The fastest riser rode 11 laps in 50.25 mins. The most important statistic though… I’m going back next week for Round 2… I think I’m hooked on cyclocross… roll on the winter?? Update 21st Mat 2015, click here to find out how I faired in Round 2.